It’s pretty much guaranteed that every month in New York offers a bewildering number of new dishes to eat, drinks to imbibe, and food-themed events to attend. It would be impossible to pack in every single thing each month, and the hardest part often is just figuring out what to do with your limited time. So Grub has decided to kick off the month with a short but sweet list of dishes, drinks, and events that should absolutely be on your agenda. Make your plans now. The Houston import’s just-debuted dinner menu includes a family-style rendition of the classic Indian dish rogan josh for $62. 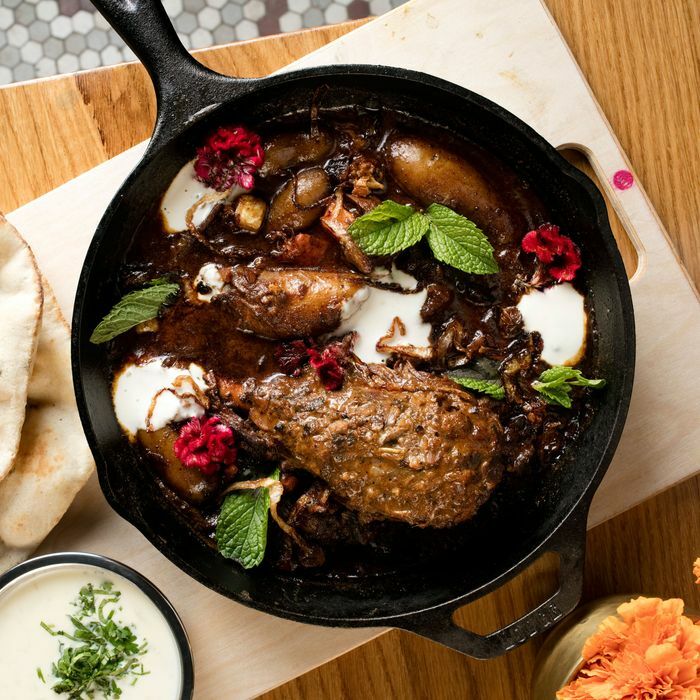 The lamb shank is cooked overnight and served with butternut squash and eggplant stewed with coconut, almonds, ginger, cardamom, and Kashmiri red chile. It comes with naan, for soaking up the sauce and making DIY sandwiches, and a saffron-cucumber raita on the side. There are new faces in the kitchen at Andrew Carmellini’s Noho French restaurant. Brian Nasworthy, a veteran of Per Se, has taken over as chef de cuisine; and Tyler Atwell, who spent time at Boulud Sud, is now pastry chef. That means new dishes like herb-roasted monk fish with savoy cabbage and truffle sauce, and, on the sweet side, coulant chocolate citrouille with candied pumpkin seeds and ginger ice cream. Speaking of French cuisine: After a monthlong hiatus, Alain Ducasse’s hyper-traditional Parisian bistro reopens with a revamped space and a tweaked menu to match on September 6. The new dishes are in keeping with the restaurant’s old-school French spirit, and include seaweed-steamed fluke, chicken ballotine with pickled chanterelles, and profiteroles to share. It’s Ron Swanson’s idea of a food festival. Breakfast website (and home of the bacon critic) Extra Crispy will throw its first event on September 3 and 4. Held in partnership with Jimmy Carbone, of Jimmy’s No. 43, and Food Karma Projects, the two-day event will go down on the Manhattan waterfront and cost $45 to enter. There will be 20 chefs, ten stations devoted to breakfast foods, themed booths and tastings, live music, and a Breakfast King and Queen pageant on Sunday night. Head this way for discounted tickets. Following an example set by restaurants in Italy, some of New York’s Italian restaurants are aiding Italy’s earthquake victims with pasta. 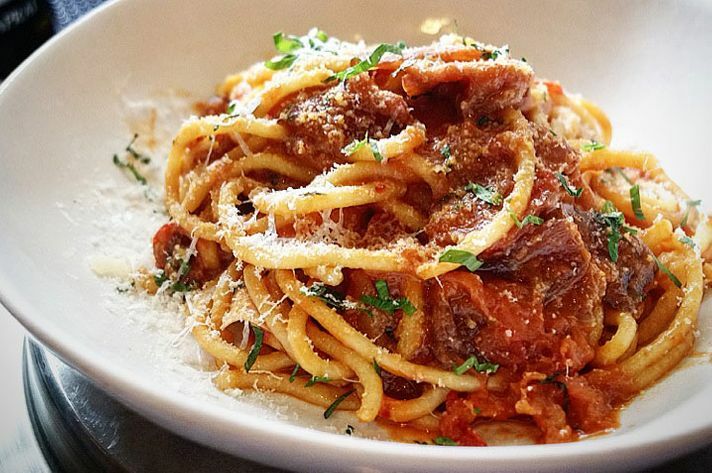 Restaurants donating proceeds from plates of pasta all’amatriciana include L’Amico ($22, with $3 going to the Italian Red Cross,) Ribalta ($12, $4 toward earthquake relief), LaRina Pastificio & Vino ($2 for every dish sold), and Felidia ($30, $5 to Italian Red Cross). Further, Felidia will host a fundraising dinner on September 15 ($350 per person, 100 percent of proceeds go to the Italian Red Cross) and Eataly Downtown will do the same on September 16 ($1,000) with Mario Batali, Daniel Boulud, and other chefs. If you want noodles but are feeling ramen fatigue, head to the first international outpost of the much-loved Japanese udon specialist Tsurutontan in the old Union Square Café space. The chain serves a revolving menu of 30 to 40 options, so go crazy and get yours with cod caviar? It’ll set you back $16. 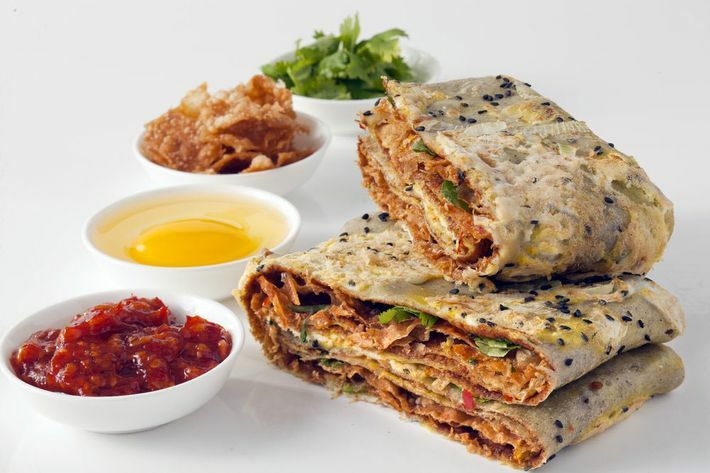 On September 10, Urbanspace’s outdoor market (11 a.m. to 9 p.m. daily) in Madison Square Park returns with a mix of veteran vendors — Roberta’s, Ice & Vice, the Cannibal — and rookies, including Amali Mou and Mr. Bing, meaning you can find out what this jianbing craze is all about, if you’ve somehow missed it so far. For one afternoon only (September 3, 11 a.m. to 6 p.m.) the outdoor food fair invites culinary rookies to throw their spatulas in the ring and cook an original dish for the first time for a panel of judges. The prize? The top three will get a booth at the annual Grub Street Food Festival. The strong lineup for this year’s All-Star BBQ at Taste Talks in Brooklyn includes Emily, Hard Times Sundaes, Hometown Bar-B-Cue, DBGB, Indian Accent, Insa, and Morgenstern’s Finest. Buy tickets here; the discounted admission will cost you $45. Osakana, the new fish market in Williamsburg from the Okonomi team, offers classes on fish butchery and making ramen, but the highlight is the make-your-own-sushi parties held right at the market. For $45 per person, the market will host you and at least five friends to drink beer and live out all your Jiro-inspired fantasies. Make a reservation here. In anticipation of launching their own brewery, bartenders from Greenpoint’s excellent beer bar Tørst have collaborated with Long Island City Beer Project on an American pale ale. Brewed with wheat malt, oats, and American hops, the 5.5 percent brew, called Depth Perception, is currently on tap at the bar. It’s available in 5-ounce ($4,) 8-ounce ($5,) and 14-ounce ($7) servings. International hot-pot chain Little Sheep Hot Pot landed in Manhattan last month when it opened its second New York location at 105 Bowery in Chinatown. (The other is in Flushing.) It’s not fall yet, but it will be soon, and you will then crave thinly sliced beef and enoki mushrooms dipped in boiling-hot, spicy broth. This is the place to do it.